– Chop the mushrooms into quarters. – Heat a splash of olive oil in a pan, then add the mushrooms with a pinch of salt. – Stir until slightly browned and reduced then add the brandy. – Simmer for about 5 minutes. – Take off the heat and then add the cream and a bit of pepper and stir. – Return to the heat and then bring to the boil. The cream should thicken. Add the corn flour in water and stir thoroughly for 2 minutes until the cream thickens further. – Spoon into warm ramekin dishes and serve with warm bread rolls. This is a great recipe as you can make it in advance and leave it to marinate overnight/all day or you can throw it together a scant hour before and it’s still a great tasting dinner. You want to serve it with a mild tasting vegetable as the marinade can have a bit of a kick to it and the contrast is welcome. A dollop of yogurt or creme fraiche works nicely too. – Mix the garlic, paprika, coriander, cayenne and lemon rind and juice in a bowl. – Add the fresh herbs and yogurt and mix well. – Spoon a few spoonfuls into the bottom of an oven proof dish. 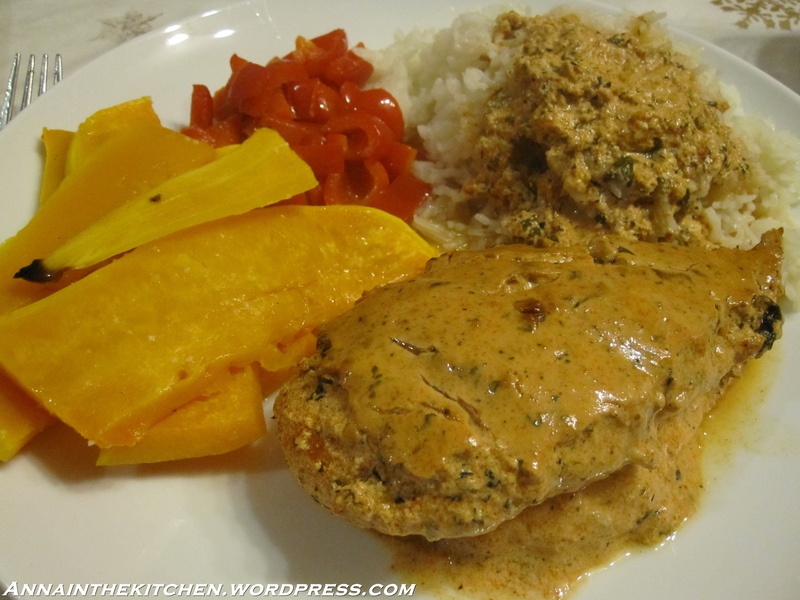 – Slash the chicken breasts a few times diagonally then place in the dish on top of the mixture. – Spoon the rest of the mixture over them making sure they are coated all over. – Leave to marinate for about 30 minutes, overnight if possible. – Heat the oven to Gas mark 6 and bake for 30 minutes. – Serve with basmati rice and vegetables**. * I keep a bunch of this in the freezer then just use scissors to chop off as much as I need for a recipe. I also keep a jar of it about for emergencies. ** Optional but delicious! I like to serve sauteed red peppers and either butternut squash roasted with a little garlic and sea salt or courgettes and green beans sauteed in butter. – In a food processor place the butter and sugar and blend until smooth. – Add both of the flours and a pinch of salt. Whizz until it’s all mixed. – Turn the mixture out onto a sheet of clingfilm and shape into a roll. – Wrap it in the clingfilm and put it in the fridge for at least half an hour and up to 2 days. – Heat the oven to Gas Mark 4 and line 3 baking sheets with greaseproof paper. – Take the roll out of the fridge and slice into rounds. If the mix isn’t keeping it’s shape use your fingers to smooth out any bumps and if necessary roll a ball the size of a small walnut then press down with the heel of your hand to flatten it into a biscuit. – Remove from the oven and leave on the trays for about 10 minutes to firm up, then place in a tin to keep. Best eaten slightly warm! *I find an upturned roasting or bread tin in the bottom of the oven makes an excellent third shelf when baking, just give the tray on this level a little longer. – Quarter the apricots and remove the stones. – Crack the apricot stones with a mallet and a lot of strength and take out the kernels. Drop these into a cup of boiling water. – After a minute take the kernels out and remove the brown skin. – Put the apricots, kernels, lemon juice and water in a very large pan. Simmer for 15 minutes until the fruit is soft and the contents are well reduced. – Take the pan off the head and add the sugar, stiring until it is dissolved. – Add the butter and return to the heat boiling rapidly for about 15 minutes or until setting point is reached** make sure you keep stiring it from time to time or it may burn. * This recipe can be adapted with a bit of mathematics to any quantity of apricots. ** To test this first hold up the spoon you are stirring the mixture with and see how it drips. When the drips get slow and it looks more viscous instead of rapid and runny test a small bit of the jam on a small plate that you have put in the freezer. If you push this jam across the plate with your finger and it wrinkles up ahead of your finger then it has reached setting point. *** To sterilise the pots before use wash them in hot soapy water and rinse them thoroughly. Then put in the oven on a low heat to dry. Bring out of the oven fill and put the lid on while it’s still hot. This forms a seal and means it will remain sterile. – Put the garlic and olive oil in a small bowl. Put to one side. – Combine the flour, yeast, salt and water in a large bowl and mix with a wooden spoon until combined. – Add the oil and continue to mix. – Turn out onto a floured surface and knead for 10 minutes until smooth. – Place in an oiled bowl an leave in a draft free warm place* for an hour or until doubled in size. – Knock down the dough and turn out onto an oiled baking tray. – Heat the oven to Gas Mark 7. – Once the dough has risen again use your fingers to poke the indentations into it all over. – Press tomato pieces into these holes and drizzle with the garlic andolive oil. – Bake for 10 minutes then remove from the oven and poke the shredded mozzerella into the indentations too. – Scatter with a pinch of sea salt and the rosemary. – Return to the oven for 15 minutes. – Remove from the oven and serve straight away. * On a warm day I find that putting the bowl, covered in a teatowel, inside a basket in the conservatory is perfect. Good comfort food this, great served with vanilla ice cream or any kind of cream actually. It’s a great follow up to a roast as you just chuck it in the oven about an hour before you want to eat it and leave it until you pull it out and dish it up. It’s a very flexible dish, I had the oven on at Gas mark 5 and 7 and finally off while cooking this and it usually comes out just about perfect every time. You can replace the plums with most other fruits too, but keep an eye on it to see it doesn’t over cook. – Slice the plums into 1/8ths and remove the stones. – Put in a pudding basin and sprinkle with half the sugar. – Top this with the bread crumbs and sprinkle with the other half of the sugar. – Slice up the knob of butter and dot it all over the top. – Place in the oven for an hour at Gas mark 5 or if you have something else cooking as a main course then put it in with that until the juice bubbles up and stains the crumbs. – Mix together the marscapone, cream and icing sugar in a small bowl. – Put the crushed digestive biscuits in the bottom of the ramekin dishes. – Top the biscuit with a few spoons of fruit, including the juices, dividing it evenly between the bowls. – Spoon the marscapone mix on top of the fruit layer. – Smooth down and garnish with a few pieces of fresh fruit. – Chill for at least 30 minutes.